Many of them are independents, and they could be key to Clinton’s general election success. Hillary Clinton at a campaign event Monday in Bowling Green, Kentucky. Donald Trump has gained on Hillary Clinton in recent national polls after becoming the presumptive GOP nominee this month. But Trump may also be helped by the ongoing primary battle between Hillary Clinton and Bernie Sanders. Although Clinton’s substantial lead in pledged delegates (and larger lead in overall delegates) makes her the all-but-certain Democratic nominee, her lack of support from Sanders voters is harming her general election numbers. The good news for Clinton is that she has the opportunity to gain ground among Sanders voters if and when she officially wraps up the nomination, just as Trump did among Republicans. Although many Sanders supporters will start the general election campaign with a negative view of Clinton, they aren’t necessarily eager to vote for Trump. In the YouGov poll, just 55 percent of Sanders supporters said they’d vote for Clinton over Trump in November. However, only 15 percent said they’d vote for Trump. That leaves 30 percent of Sanders voters who say they are undecided, would vote for a third-party candidate or would sit out the election. There’s a key twist, though, in tracking how Sanders voters are affecting Clinton’s general election prospects. Unless you break out the numbers for Sanders voters specifically, as YouGov does, you may miss their importance. Overall throughout the primaries and caucuses, I estimate, Clinton is beating Sanders by 27 percentage points among self-identified Democrats but losing to Sanders by 31 points among voters who call themselves independents but voted in the Democratic primaries.2 This might be confusing because we usually think of independent voters as being moderate. Sanders voters, however, are definitely to the left of Clinton, but a lot of them don’t like to call themselves Democrats. (Sanders himself, of course, has repeatedly been elected to Congress as an independent and did not officially declare himself to be a Democrat until November.) As a result, about 40 percent of Sanders’s primary and caucus voters identify as independent, as Republican or with some party other than Democrats, according to my estimates. Thus, citing Clinton’s reasonably strong general election numbers among self-identified Democrats — she had the support of 87 percent of Democrats in a recent NBC News/SurveyMonkey poll in her matchup against Trump, for instance, and 83 percent in a Fox News poll that showed her behind Trump nationally — may miss her problems among liberal-leaning, Sanders-voting independents. In the Fox News poll, only 30 percent of independents went for Clinton, and in the SurveyMonkey poll, just 36 percent did. But both surveys showed a large pool of undecided independents, potentially the Sanders voters that YouGov identified. If Clinton wins over those voters, she’ll gain a few percentage points on Trump in national and swing state polls, and the race will potentially look more like it did in March and April, with Clinton having a fairly comfortable lead over Trump. If not, the general election could come down to the wire. 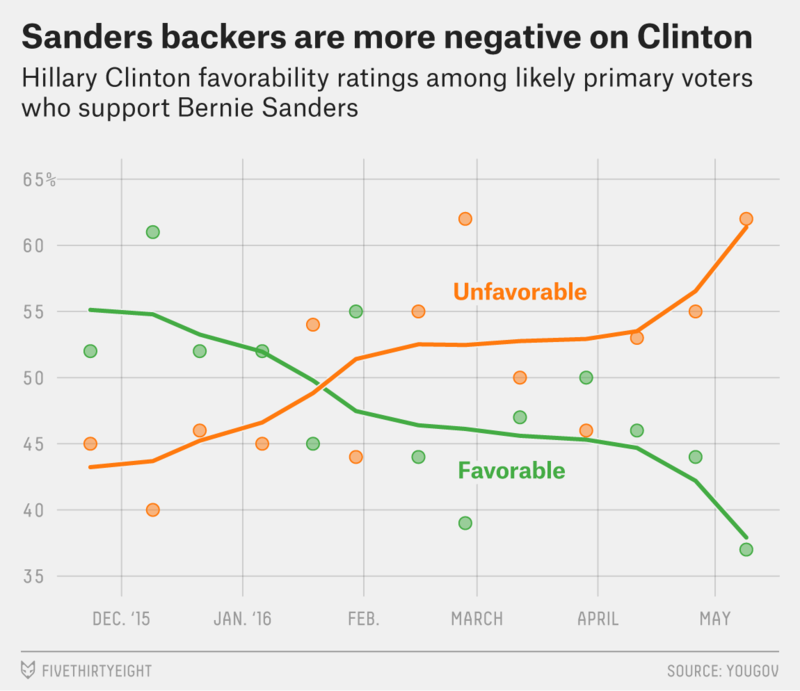 YouGov has been publishing Clinton favorability ratings among Sanders voters only since its survey released March 14. However, I was able to infer them dating to November by using Clinton’s overall favorability ratings among Democratic primary voters. Because almost all (about 95 percent, according to YouGov’s recent survey) Clinton primary voters have a favorable impression of Clinton, we can estimate what her ratings were among Sanders voters by backing the Clinton voters out of the sample. These national estimates are weighted for the turnout in each state. They also adjust for the fact that the states where exit polls have been conducted have been slightly more favorable for Clinton than the Democratic electorate as a whole.